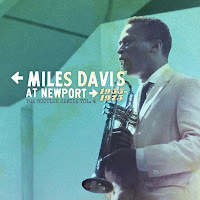 The newest entry in Columbia/Legacy Recordings’ critically-acclaimed Miles Davis Bootleg Series, NEWPORT 1955-1975 clocks in at 296 minutes, nearly four hours of which is previously unreleased. From Miles’ debut performance at NJF in 1955 (a hastily arranged jam session featuring Thelonious Monk and Gerry Mulligan, that immediately led to the trumpeter’s Columbia signing), to his final public perform­ance of the ’70s in 1975 (at Lincoln Center during NJF-NY, the singular “Mtume” named for Miles’ favoured percussion­ist of that decade), the box set traces the ascendance of Miles’ music as the ne plus ultra of jazz. The full-length concert performances alone of Miles’ famed “Kind Of Blue” Sextet (with Cannonball Adderley, John Coltrane, Bill Evans, Paul Chambers, and Jimmy Cobb), and ‘second great quintet in ’66 and ’67 (with Wayne Shorter, Herbie Hancock, Ron Carter, and Tony Williams) represent templates that reverberate in jazz and popular music to this day. (Editor’s note): With five hours of playing time I’ve yet to find an opportunity to listen to the full collection (received via download) but what I’ve heard so far – the jam sessions with Zoot, Gerry, Monk etc. - is great stuff and with the sessions by the Kind of Blue band and the later groups to look forward to this one of the classic collections worthy of inclusion in anyone’s collection.